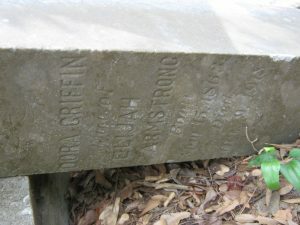 Dora Griffin Armstrong was born in Georgia. According to census records her parent were born in Virginia. Also in the 1870 Federal Census in Huntsville, Walker County, Texas, is a listing for Thomas Griffin, born about 1850 in Georgia. 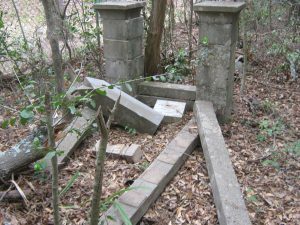 (2) Could Thomas Griffin be Dora’s brother and the same Thomas Griffin who is also buried in the Conroe Community Cemetery? She died on 9 Oct 1918 while living at 1308 McMillan, Houston, Harris County, Texas, from mitral insufficiency. She is listed as being widowed, her father was Tom Griffins and unknown mother. The informant was F. Armstrong. I.S. Lewis of 2615 1/2 Odin Avenue was the undertaker and she was buried in Conroe. (1) “United States Census, 1870,” index and images, FamilySearch (https://familysearch.org/pal:/MM9.1.1/MXGX-Q1M : accessed 6 February 2015), Dora Griffin in household of Wade Hampton, Texas, United States; citing p. 14, family 105, NARA microfilm publication M593 (Washington D.C.: National Archives and Records Administration, n.d.); FHL microfilm 553,106. (2) “United States Census, 1870,” index and images, FamilySearch (https://familysearch.org/pal:/MM9.1.1/MXGF-JRZ : accessed 6 February 2015), Thos Griffen, Texas, United States; citing p. 21, family 153, NARA microfilm publication M593 (Washington D.C.: National Archives and Records Administration, n.d.); FHL microfilm 553,106. (3) “United States Census, 1900,” index and images, FamilySearch (https://familysearch.org/pal:/MM9.1.1/M3PG-HRJ : accessed 6 February 2015), Dora Armstrong, Justice Precinct 7 Conroe town, Montgomery, Texas, United States; citing sheet 11B, family 217, NARA microfilm publication T623 (Washington, D.C.: National Archives and Records Administration, n.d.); FHL microfilm 1,241,660. 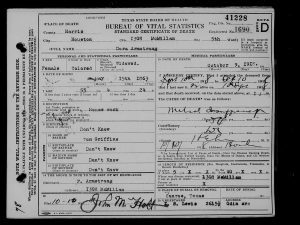 (4) “United States Census, 1910,” index and images, FamilySearch (https://familysearch.org/pal:/MM9.1.1/M2MV-T11 : accessed 6 February 2015), Dora Armstrong, Houston Ward 5, Harris, Texas, United States; citing enumeration district (ED) 67, sheet 9A, family 160, NARA microfilm publication T624 (Washington, D.C.: National Archives and Records Administration, n.d.); FHL microfilm 1,375,573. (5) “Texas, Deaths, 1890-1976,” index and images, Ancestry.com (http://interactive.ancestry.com/2272/33154_B061844-02831/30123659 : accessed 6 February 2015), Dora Armstrong, 09 Oct 1918; citing certificate number 41228, State Registrar Office, Austin; FHL microfilm 2,073,348.